A light facial moisturizer designed to enhance your natural beauty from within. Radiance Daily Moisturizer hydrates and softens your skin while smoothing wrinkles and reducing the look of aging. Our natural, organic ingredients are known to protect against environmental damage, prevent redness, acne, wrinkles and dry skin. Nourish your skin's natural glow... and stop aging in its tracks! Facial Moisturizer: Use morning and night as required. Scoop out a "pea" sized amount with the back of your nail, rub between fingers or palms to warm and melt the facial cream. Apply to face, neck, and body. After Shaving: For Men & Women - After rinsing off any shaving lather, pat skin dry with a soft towel. 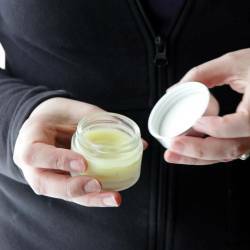 Scoop out a "pea" sized amount with the back of your nail, rub between fingers or palms to warm and melt the facial cream. Apply to face, neck, legs, bikini and/or arms. * Store in a cool dry place with lid secured. Beeswax * Canadian - Wax produced by the honeybee.